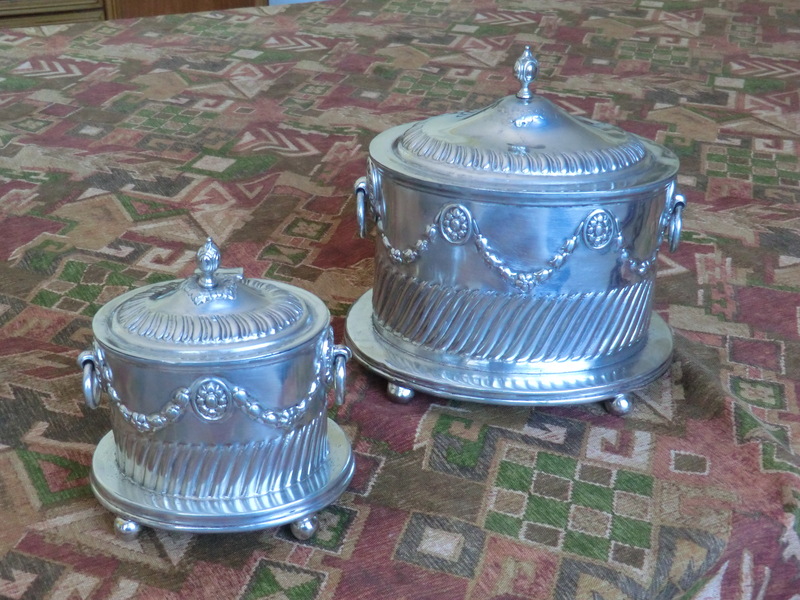 Last week in Marrakech I bought a couple of interesting silver-plated objects – a sugar-box and tea-caddy made by Richard Wright of Manchester. Wright has, as all Moroccans know, given his name to the silver tea-tray, or rayt, and was also responsible for what must have been enormous exports of silver-plate from the 1830s onwards, perhaps well into the latter part of the century. Wright teapots are common enough, especially 1½ pint plain silver pots. I have also seen 2 pint versions of the same, and others with repoussé flower-decorations. There are much more elaborate 1½ pint (and perhaps larger) sharafia-work teapots with feet, lattice-work engraving and crowns on the lid. My two boxes are the first I have seen, though I don’t imagine they are enormously rare. It is clear that Richard Wright set out to supply the utensils for the budding tea-trade between England and Morocco. With tea-trays, caddies, sugar boxes and tea-pots he seems to have covered the field: I have also seen an incense-burner, and heard tell of a coffee-pot. The interesting thing about Wright is that I can find no trace of him in Manchester or anywhere else in England. It is possible that his work came to be imitated in Morocco, and that later Wright pieces are local copies, perhaps made in Fes to capitalize on the popularity of the Wright brand. But the original Wright must have existed. Who was he? His mark appears in no directory of silver plate marks that I have consulted; and his name is absent from trade directories. English museum metalwork departments know nothing of him. One possibility is that his was a confected identity created or taken over by Jewish or Muslim Moroccan traders in Manchester to brand exports to their home country. The dealer who sold to me in Marrakech last week told me that the sharafia work decoration was applied to silver put out to Jewish metalworkers (presumably in Manchester, though he had no idea of this). Many, perhaps most, Mancunian Moroccans were from Fes, the centre of the fine metal-working trade in Morocco, and later a major centre of tea-pot manufacture. To be honest I am not sure of value – these teapots are fairly common, and the simplest ones seen to sell for between 300 and 500 dirhams in the suq. The more sophisticated models are rarer, and I haven’t seen enough to have a clear view on price. I have nine pieces of Richard Wright tee service. Two trays (different size) two teapots (different ornaments) three boxes (different seize) and two rosewater sprinklers (identic). One of the pots and the three boxes has the same, very nice decoration. I will try to send photo of them. Vous avez les photos ?? I bought a very similar model in Istanbul at an auction today for a very low price (not even 10 Euros). 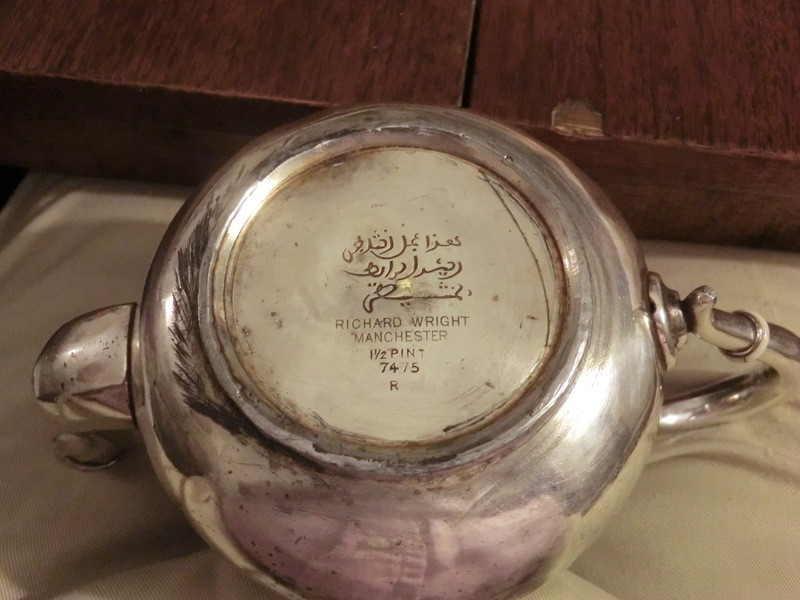 It was very dirty but when İ cleaned it at home İ realized that it must be silver but it has an Arabic stamp on it which İ don’t understand…İ think it’s a copy of Richard Wright’s but İ’m not sure. The stamp also includes 5 stars and a few more things…İ would like to share a photo but somehow İ can’t upload any here… I wonder if it’s silver or not? I have four of these, a 2 pint tea pot, a large tray 24 inches in dia. a large and a small box for tea and sugar. Is there anyone out there with any more info. I would like to know more. I have too large trays fromm Richard Wright and i would like to know something more about this man and his work. The date is 1777 Richard wright Manchester and there are a story that was related by my family about this pieces who begins when a familiar near the year of 1890? returns to Portugal from Marroco where has happened a large fire and looting and everibody cacth everithing they can etc… This pieces was buried during many years and one day my aunt decide to dig them, because she knows where they are. The reason to bury the pieces was because her mother dies whith tubercolosis and it was usual people buried the belongings of that peolple. Jose, thank you for this information. The tray is a very typical Wright piece, and (as I’m sure you know) the Moroccan darija word for a silver tea-tray is ‘rayt’ after him. I am afraid though that the 1777 below or above the trade mark is unlikely to be a date – all old Wright pieces of silver plate have a four-figure number in this position, and I take it to be a serial number, identifying the model. I certainly don’t believe that Wright was working as early as 1777: though I can’t yet demonstrate exactly when the first pieces of plate or silver were made, I think it sas in the 1860s or 1870s. A for the story of Richard Wright himself, I am working on it now and plan to write an article or small book on him and the silver trade. When I do, I’ll announce it on this blog. Thanks for your message. Not a great deal more to say at this point – I am doing some research on Wright here in Morocco and in England, and hope eventually to write a book. But there is very little information easily found at the moment. One thing that’s clear though is that Richard Wright was probably not himself a very important individual – a commission agent rather than a silversmith. 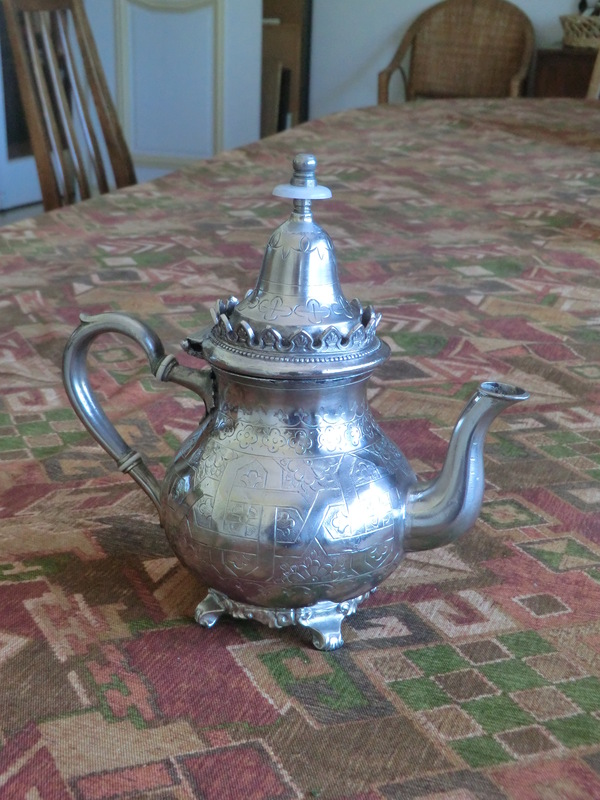 I think he had silver plated objects made to order for Moroccan merchants who then exported them to Morocco. 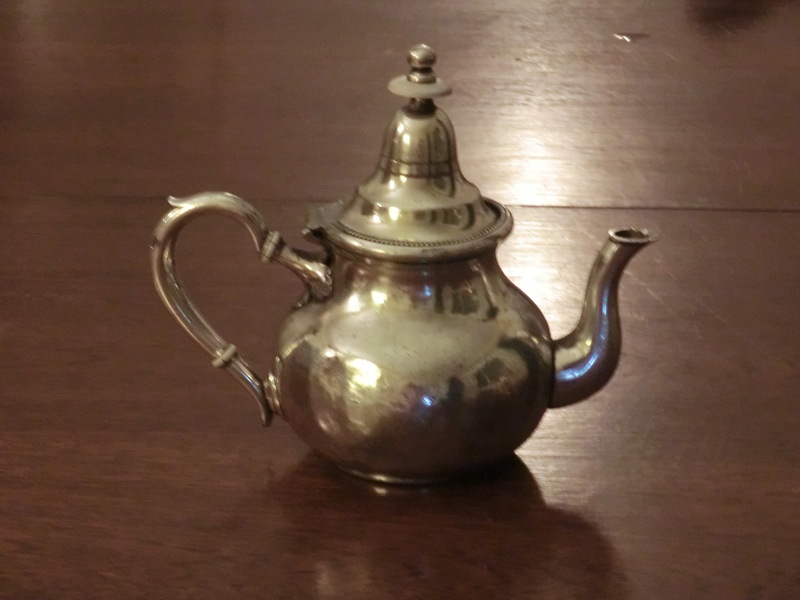 What is interesting is that Wright teapots are the first, I think, to have the characteristic ‘Moroccan’ pointy lid; and at least one author believes that the ‘typical Moroccan’ teapot was designed in Manchester. My name is Hamza El Fasiki, i am Apprentice Artisan in Seffarine Fez and son of a Master Artisan and Lamin ( Head of the Cooper-smith Corporation). I believe we met in the Seffarine square once in 2013 i guess; you were with your son and daughter and i was with a Tourist green hat. Your post is too great – it opens new critical ideas on Wright. You are totally right. As i begun writing my MA Thesis on Seffarine in 2011, i came across almost no tangible reference on Wright. I do have a perfume article from my father. Yet, the only issue which seems NOT REAL but TRUE is that the Wright as a person and as an entrepreneur ( and even as a business) exists in the mind of the artisans. My father and my family never stops believing in him. There is a fine book which talks about the history of Seffarine and mentions Wright but i could no ship it to Morocco and could not get a PDF Format. P.S. : I shall be happy to talk more about him. I recently purchased this pendant. It is a talisman typical of Morocco. I wonder if someone can infer the age from the marks. My name is fassi fihri, my Mothers name is Ziat. Her grand father, el Haj Mhammed ziat was born in Fez Morocco, and leaved in manchester in the end of the 19 century, and the bigining of the 20th . El Haj Ziat was the partner of richard Wright to introduce and adapt his creations for Morocco, and other islamic countrys. El haj ziat create his own silver product nown as “five stars”. my family has a very a large collection of Richard Wright silverware from teapots to many different sizes of trays and other tea/sugar boxes. i am very interested to know more about these objects and Wright himself.I myself cold not find any relevant info about him. i do have one question though? Is all Richard Wright’s work made of silver or is is it silver plated? My family has a collection of wright ‘s tea trays the first pieces were bought by our great*3 grandfather Sheikh Beyrouk in 1850. We have two exceptional pieces of 120cm diameter pure silver tea trays. Very interesting. How sure are you of the date? It’s earlier than I would have expected, so if your ancestor actually bought pieces in 18950 it might put back the first date for the business significantly. Hello, does the crown stamp illustrate that the piece was palace property? It is really interesting to hear that you are making a research about The Wright’s work especially about the tea pot and trays. According to what I know personally is that the teapots and trays were made in Mansheter by Moroccan minority that lived there. They used to export the products back to Morocco. Then with the French colonization they put more taxes on any imports that made the Wright go backrupt and and the iteams we have in Morocco Are very unique. I will come back to you as I will contact the right person to provide more informations as he knows more.